Registration will be available beginning in February and details will be updated at that time. We will have a information meeting for those that sign up on the BCO calendar ---look for it on the calendar. Davis Mountains Fitness & Training Camp in West Texas is a week of laid back or endurance activities...its your choice. There are 3 levels of supported events each day. Bike, swim, run, hike and more! CAMP FILLS UP QUICKLY--SO REGISTER AS SOON AS POSSIBLE beginning in February 7--Deposits is $100. Deposit are NOT refundable but can be carried over 1 year. Final payment date will be July. Throughout the week you can choose various daily activities located either on the ranch property or off-premises. You can start your morning off with a pre-dawn walk or an early morning run. After breakfast, you can choose an activity, such as a bike ride or a hike or you can attend the various clinics and lectures that are scheduled throughout the day. Not all camp is physical! In the evening, there are activities such as nature or nutrition lectures, classes, and dance lessons. · Workshops on changing flat tires, shifting gears, etc. Early afternoon and evenings can also be spent doing things on your own, such as visiting the McDonald Observatory, driving to Marfa to view the "Marfa Lights," taking a cool dip in the Balmorhea spring-fed pool or relaxing on your porch! 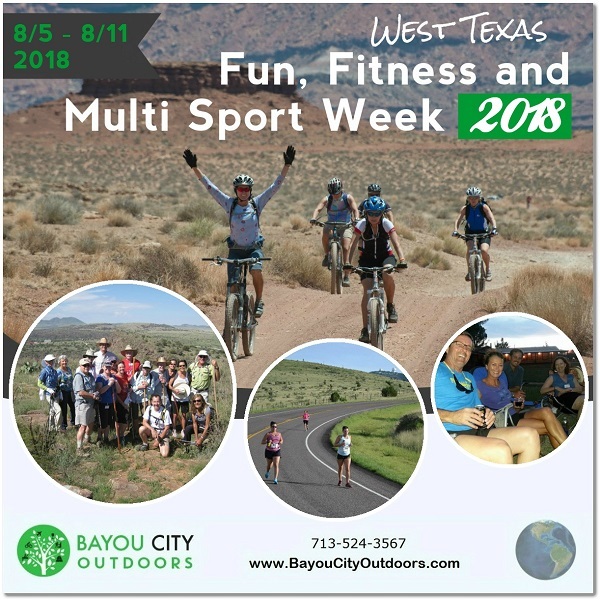 Come to the Davis Mountains Fitness & Training Camp in West Texas for an energizing week full of activities and programs designed for the serious athlete, the weekend warrior or the eager novice.